This is just the second album so far in the career of the talented Patrolled by Radar, a band that mixes myriad diverse roots styles into their own quirky and unique sub genre. Detectable on both of these excellent albums have been elements of most styles within roots music including country, blues, rock and soul, all mixed together to produce a sound entirely their own. Not for them any attempts at showing a mastery of just one style, although the tap root of their sound is detectable as country music, so perhaps the often used tag of alt. country suits our purpose when ‘pigeon holing’ this excellent band. Of course they are not harmed by the fact that lead vocalist and main songwriter Jay Souza is a tremendous interpreter of songs, with his own vocal and writing style that really can’t be confused with anyone else’s. Strangely they often remind me of Brit band ‘Squeeze’ although I think this is more likely because they have their own distinctive and quite quirky style, one that doesn’t allow for half measures or any holding back in any area. All songs on this recording were written by Jay Souza, with the exception of a terrific version of Randy Newman’s Ghosts, someone in whose song writing company Jay is far from shamed. Somehow I occasionally get the feeling that Jay’s lyrics can lessen the impact of the music, not in a way that takes any of the albums quality away but it does seem that where there is balance between music and lyrics the songs seem to take on an extra power. It is difficult to quote any particular songs, it’s just that on occasions I remember the story line rather easier than the melody. Maybe it’s just me getting carried away by the songs story and it is certainly a tribute to his lyrics, or maybe it’s just that unique style that makes you listen in a different way. Certainly this album is a lyric driven recording with many of the songs blending to form a reflective, often thought provoking, picture of life and the world at large, and despite my previous statement, the melodies are of a similar high quality. Of course, not only is the band lineup perfectly suited to ‘alt. country’ but Jay’s always recognizable vocals are ideal for this and just about any other roots sub genre. That lineup consists of the already mentioned Jay Souza on lead vocals and guitar, Bosco Sheff, guitar, Preston Mann on organ and piano, Ben Johnsen, drums and vocals and Peter Curry on bass. Only Souza and Sheff remain from the previous album although Peter Curry who produced their debut carries out the same duties here and as can be seen above, plays bass, although I don’t know if he is now a permanent member. Jay’s previous band was ’50 Cent haircut’ another excellent band who made several albums and for whom Souza wrote all of their songs, this experience explaining how he came to be such a thoughtful, skillful songwriter of poetic lyrics as well as very good melodies. The album opens with I Died With Money, Jay’s excellent lead vocal and the songs arrangement giving the story an almost threatening air on this terrific mid tempo alt. country song that is a warning to all those who put the making of money before all else! El Norte is a quite spectacular, as well as excellent, sad tale of an immigrant who misses his old life despite the grinding poverty that he grew up with. The lovely deep twangy acoustic guitar and suppressed keyboards propel this gorgeously melodic song that fluctuates in tempos and spectacle, with guitars going from twang to alt. rock but in just three verses telling a cinematic story. Fool is an excellent alt countryish song about someone who after a life of innocence sees the world perhaps as it is, with the keyboards, drums and chiming guitars propelling an easy on the ear melody. Finally, Do You Know A Love Song is driven by a thumping bass and drum with lovely accordion in the background and excellent harmonies on an uplifting, if sad, love song made more atmospheric by the inclusion of a haunting steel guitar. 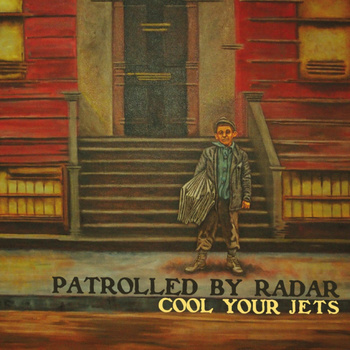 Patrolled By Radar are a band who, if they can be heard by more people, should eventually receive the acclaim and success their talents deserve. As usual we come back to that most expensive of all elements of the music business, ‘Promotion,’ but instead of purchasing an album by an over hyped manufactured artist, buy this album by a highly original band who will continue to plough their own unique musical furrow. I promise that you won’t regret it!